Twilight - and its film franchise Saga - highlights the challenge women behind the camera, working as screenwriters and directors, face in the #TimesUp era. First written as a novel by Stephanie Meyers and directed by Catherine Hardwicke, the melodrama is directly aimed at the young female demographic and pretty much fails the Bechdel Test. This test is a general indicator of female empowerment. Does the film have at least two women in it? Do they speak to each other about something that doesn’t relate to a man? The film is a good example of the male gaze, created and promoted by women, before the #TimesUp movement began to raise the consciousness of a new generation of women. Meyers sets up the primacy of the male narrative from the very beginning. She creates Bella Swan, a 'heroine' who lacks self-esteem, coordination and is morbidly withdrawn. Her mother is portrayed as a self-absorbed free spirit, who treats Bella like a best friend rather than her daughter. She feels more comfortable with her rigid, uptight father, because he doesn't "hover". Most days her father, Charlie, a police officer, doesn't communicate anything more meaningful than to grunt his concern about her safety. Bella's interests extend no further than obsessing over the New Age goth vampire Edward Cullen. 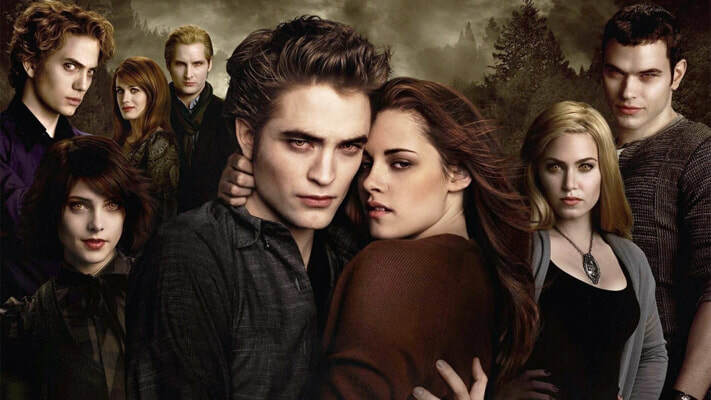 The Cullen family is headed by father-figure, Carlisle, a progressive physician who makes all the decisions for the group of 'vegetarian' vampires. Predictably, Edward performs as the Protector: keeping family secrets, watching out for Bella and battling an ever-growing population of people-eating vampires. As the film franchise itself continues, the male narrative becomes even more sexist. Edward is always competing with Jacob, the neighborhood shape-shifting wolf, for Bella's attention. Events conveniently conspire to keep Edward out of the picture, so Bella can run interference for him with her family and friends. 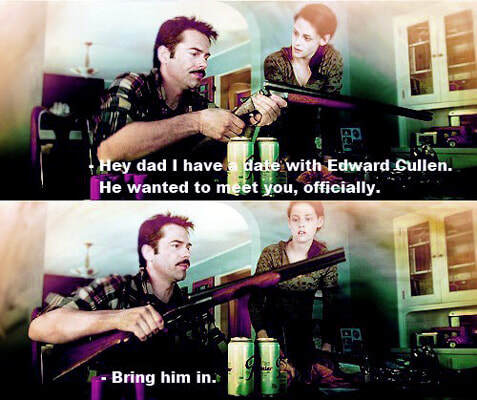 This allows Jacob to spend his time convincing her that he's a better choice of a mate than white boy Cullen. Even after Bella and Edward get married and have a child, he’s not content to accept Bella's decision, but instead 'imprints' - or claims - their daughter as his future mate, while she's still an infant. Bella spends the better part of four films standing around, simmering with indignant rage, as the males make all the choices for Bella - all to keep her safe, of course. *Bella is solely focused on Edward. *Bella is always panicked at the thought of losing Edward. *Bella wants to turn into a vampire - like Edward - so they can live in bliss 'forever'. In the later films, Bella will talk about love, marriage and babies, and when it comes time to give birth, she'll isolate her mother entirely, implying that she wouldn't be able to handle having a granddaughter who is a vampire that instantly aged from an infant into a young girl. This fuzzy logic supports the notion that mothers who aren't physically available for their children should be punished, because only the solid-as-a-rock Charlie is allowed the privilege to be a grandfather. 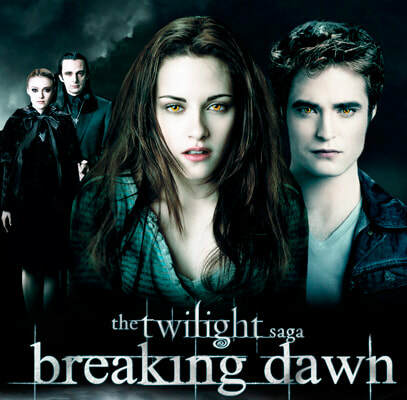 The source material for Twilight derives from Stephanie Meyer's perspective, and while her Mormon beliefs may play a small part, the main influence lies in the romance genre itself - which was born in the pages of lofty Greek literature like Heliodorus’ The Ethiopian Tale. ​The all-encompassing focus on a young woman as a wife and mother, surrounded by the 'protective' love of males in her environment is little more than a patriarchal call for primal dominance over women. Sadly, Twilight’s story of a teenage girl’s obsessive willingness to dumb down her life for hypersexualized romance has been Hollywood’s standard script for almost a century. Hollywood continues pushing the standard male gaze onto a new generation of girls and young women, creating a false sense of empowerment by using women behind the camera. Melissa Rosenberg's film treatment of Meyer's first novel, boasted Catherine Hardwicke as the director. Rosenberg would go one to write all five screenplays, and although it hardly mattered, the next four films were directed by men. Overall, the Twilight Saga raked in almost four billion dollars, proving that a male-driven narrative - when cleverly packaged - can still lure females to the box office. Women in filmmaking must now wield a double-edged sword, one that can cut through discrimination in hiring and at the same time create a stronger voice for the women and girls who view their stories. What is the point of directing a film or writing a screenplay that imprints the male-centered world view on a new generation?